“The Fifth Head of Cerberus” Three beautiful novellas set in the future on a colonized (or conquered?) planet. It’s been on my re-read list for a while, and I felt it would be the least intimidating to start with because it breaks Wolfe’s work up into three pieces that are easier to digest than his more robust novels. It’s also filled with beautiful characters and interesting discoveries. It would probably be my first recommendation. “The Sorcerer’s House” One of Wolfe’s more current novels and also one of my all time favorites. When I met Gene at MadCon in 2010 I actually had him sign my copy, because I had enjoyed it so much. This book is a series of letters from a man who was recently released from prison, to his brother, concerning a house he inherits and the events that transpire within it. It’s definitely a fantasy filled with some fantastical creatures and characters, but for me personally, it seemed to take the normal and mundane pieces of life and polish them up into something remarkable as well. I’d recommend this novel to anyone, and it’s an easy read for first time Wolfe readers. “Free Live Free” This particular book holds a strength in character development that as an amateur writer I could only dream of achieving. It’s a mystery with a dash of the fantastic sprinkled throughout it. I will admit it has it’s rougher parts, but nothing about it seemed meaningless or poorly executed. If you judge the books you read by the quality of their characters than this is certainly worth your time. Now these are just my personal recommendations. I’ve read over 30 of Gene Wolfe’s books and there wasn’t one that disagreed with me. They were all immensely enjoyable. These three just seemed like the ones I’d recommend the most to people wanting to experience Gene Wolfe for the first time. Feel free to comment with your own suggestions! The Guardian made up a list of 1000 novels everyone must read. 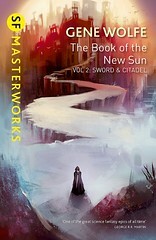 Gene Wolfe’s Book of the New Sun was, of course, in the Science Fiction and Fantasy section of the list.